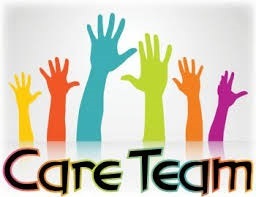 The care team in the school consists of the Principal, Deputy Principal, Chaplain, Guidance Counsellor, School Completion Personnel, Special Needs Department Personnel and Year Heads. The Care Team meets each week of the academic year to put in place relevant supports for students in need. A co-ordinated approach is taken and the team decides which teams are in need of support and determines how this support is to be implemented.